St. Martin's Griffin, 9780312304355, 416pp. This richly imagined novel, set in Hawai'i more than a century ago, is an extraordinary epic of a little-known time and place---and a deeply moving testament to the resiliency of the human spirit. Rachel Kalama, a spirited seven-year-old Hawaiian girl, dreams of visiting far-off lands like her father, a merchant seaman. Then one day a rose-colored mark appears on her skin, and those dreams are stolen from her. Taken from her home and family, Rachel is sent to Kalaupapa, the quarantined leprosy settlement on the island of Moloka'i. Here her life is supposed to end---but instead she discovers it is only just beginning. With a vibrant cast of vividly realized characters, Moloka'i is the true-to-life chronicle of a people who embraced life in the face of death. Such is the warmth, humor, and compassion of this novel that "few readers will remain unchanged by Rachel's story" (mostlyfiction.com). His work as a writer-producer for the television series L.A. Law earned him an Emmy Award and a People’s Choice Award in 1991. He has been nominated for an Emmy on two other occasions, once for a Golden Globe Award, and three times for the Writers Guild Award for Outstanding Teleplay of the Year. Alan's short story"Ma Qui" was honored with a Nebula Award in 1992. His story “Her Pilgrim Soul” was adapted by Brennert himself for the Alan Menken musical Weird Romance in 1992. His novel, Daughter of Moloka'i is a follow-up to Moloka'i that tells the story of Rachel Kalama's daughter Ruth, her early life, her internment during World War II, and her eventual meeting with her birth mother, Rachel. 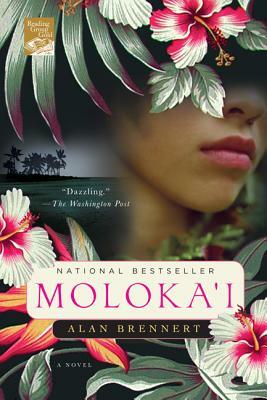 The novel explores the women's 22-year relationship, only hinted at it in Moloka'i. The book's opening paragraph likens Hawai'i in the 19th century to a garden. In what ways is Hawai'i comparable to another, Biblical, garden? Given what was known at the time of the causes and contagion of leprosy, was the Hawaiian government's isolation of patients on Moloka'i justified or not? How is Hawai'i's treatment of leprosy patients similar to today's treatment of SARS and AIDS patients? How is it different? What does 'ohana mean? How does it manifest itself throughout Rachel's life? What does surfing represent to Rachel? Rachel's mother Dorothy embraced Christianity; her adopted auntie, Haleola, is a believer in the old Hawaiian religion. What does Rachel believe in? There are many men in Rachel's life--her father Henry, her Uncle Pono, her first lover Nahoa, her would-be lover Jake, her husband Kenji. What do they have in common? What don't they? Rachel's full name is Rachel Aouli Kalama Utagawa. What does each of her names represent? Did you as a reader regard Leilani as a man or a woman? Discuss the parallels and inversions between the tale of heroic mythology Rachel relates on pages 296-298, and what happens to Kenji later in this chapter. Imagine yourself in the place of Rachel’s mother, Dorothy Kalama. How would you have handled the situation? The novel tells us a little, but not all, of what Sarah Kalama feels after her accidental betrayal of her sister Rachel. Imagine what kind of feelings, and personal growth, she might have gone through in the decades following this incident. In what ways is Ruth like her biological mother? How do you envision her relationship with Rachel evolving and maturing in the twenty years between 1948 and 1970? Considering the United States' role in the overthrow of the Hawaiian monarchy, was the American response adequate or not? In recent years a "Hawaiian sovereignty" movement has gathered momentum in the islands--do you feel they have a moral and/or legal case?